Our research topics, each an integration of long-term and short-term approaches and questions, are described below. We study biological diversity, carbon and nutrient dynamics, climate, conservation ethics, disturbance, hydrology, information management, social science, soils, stream ecology, vegetation. Additional areas include arts and humanities, LTER cross-site, regional, and international research. The old forest, stream, and meadow ecosystems of the Andrews Forest contain thousands of species of insects, 83 bird species, 19 gymnosperm species, and 9 species of fish. Biodiversity research at the Andrews examines the causes and consequences of biological diversity in our landscape and seeks to understand how land use, natural disturbance, and climate change will affect these patterns and relationships. Studies range from the genetic to landscape scales, and include field observational studies, experiments, and modeling. The upper canopy of forests is known to experience a very different microclimate than the rest of the forest: it is often simultaneously brighter, hotter, windier, and drier. The upper canopy also contains most of the leaf area, and because it absorbs most of the solar radiation, it accounts for the great majority of carbon and water exchanges in most forests. Critically, this is also the zone where most climate variations and stress likely manifest. Finally, the upper canopy is the region of the forest that is sampled by satellite imagery. A focus on canopy microclimate is enhancing our understanding of forest function and its response to climate change, and it complements and leverages ongoing, long-term climate measurements collected in the sub-canopy and at the climate stations located across the Andrews forest. The primary goal of this research is to understand whether and how the forest canopy is 'de-coupled' from the understory and connected to larger-scale climate processes, and thus might also be experiencing regional warming and drought and heat stresses. We also hope to understand how canopy microclimate observations can advance fundamental biological understanding of canopy processes and properties and their linkages to atmospheric and sub-canopy dynamics. This includes work on tree physiology (via climbing into the canopy to collect data) as well as epiphyte ecology. The ways that carbon and other nutrients move through a forest are influenced by the interaction of many parts of the ecosystem. As such, carbon and nutrients provide a way to examine ecosystem function and response to environmental change. Work in this component seeks to measure rates of production, decomposition, nutrient cycling, and the formation of soil organic matter and to determine the factors controlling spatial and temporal variation in these processes. In addition, the stores of carbon and nutrients involved in these processes and cycles are being measured. Simulation modeling, coupled with remote sensing, are being used to extrapolate results to the Pacific Northwest region. The combination of mild temperatures, wet winters, and dry summers that characterize the climate of the Pacific Northwest strongly influences many ecological and geophysical characteristics of the region. Long-term measurements of air temperature, precipitation, snow, soil temperature, humidity, and other variables have been collected at multiple sites since the 1950s. These data are used in maps, models, and analyses of temporal patterns and trends to characterize and understand the dynamic climate of the Andrews Forest. Major areas of research focus on the interactions of regional climate with topography, cold-air pooling, snowpack accumulation and melt patterns, and temporal trends in air temperature, precipitation, and snow. See our Climate Stations description page for more information on location and instrumentation. Natural resource management can be seen as a set of practices, which reflect certain ideas about the world. Ideally management practices will be consistent with our best scientific ideas about the workings of both biophysical and social systems, but management practices also and inevitably manifest our ideas about what is good, what is right, and what is valuable. For example, we manage riparian zones in certain ways because we understand certain relationships between riparian zones and streams and rivers; but also because we believe certain management practices will achieve important goals, or protect important values, related to streams and rivers. In this way, management fuses science and ethics. At the Andrews Forest, we consider ethics an inherent part of our work. We seek not only to understand how ideas work in socio-ecological systems, but also to explicitly consider how they ought to work, particularly at the interface of science and management. Formal methods of critical thinking, or argument analysis, are used to understand and evaluate both the science and ethics of management decisions, predicated on the belief that decisions made through such a process of sound and rigorous reasoning will be more systematic, more transparent, and ultimately more reasonable than they might otherwise be. Forest and stream ecosystems undergo progressive, slow change by processes such as succession and soil development. Abrupt changes are induced by disturbances such as fire, flood, wind, landslides, forest cutting, roads, insects, and volcanic activity. The interplay of disturbances and succession drive ecosystem dynamics. We study the past and present frequency, severity, duration, and spatial pattern of natural and management disturbance processes that dominate the disturbance regimes of the Andrews Forest and other parts of the Pacific Northwest. We also study effects of disturbances on biota and on ecological and watershed processes. Water stores and flows in the Andrews Forest are controlled by, and shape, the topography, climate, and vegetation in the landscape, while also affecting human uses of streams, rivers, and water resources. 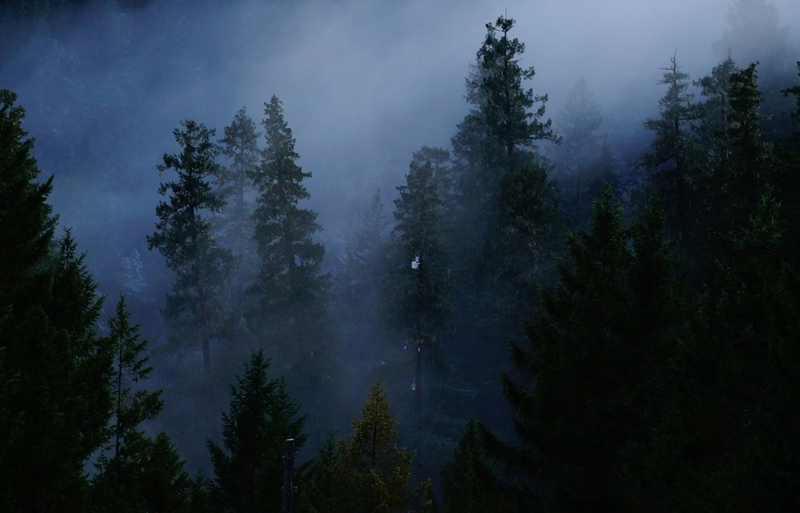 The hydrology of the Andrews Forest is representative of steep forested ecosystems of much of the Pacific Northwest west of the crest of the Cascade Range, from Vancouver, Canada to Arcata, California. Distinctive features of the hydrologic setting of this region include a mild climate with wet winters and dry summers; massive, conifer, evergreen forests with high leaf area that can intercept, store, and transpire large quantities of water; thin soils on steep, highly weathered hillslopes which facilitate rapid water flux from slopes to channels; and transient snowpacks that can contribute to extreme regional floods. Water flows from the Andrews Forest influence downstream communities including the cities of Eugene, Salem, and Portland. The Andrews Forest has a long history of research using experimental watersheds, tracer and water dating studies, process and ecophysiological studies, analyses of soil hydrologic properties, and other approaches. See our Experimental Watersheds and Gaging Stations page for more information about gages and experimental watersheds. Information Management plays a major role at the HJ Andrews Experimental Forest Long-Term Ecological Research (LTER) site. Intensive forest ecosystem research, conducted on the Andrews Forest since the 1950s, has resulted in many diverse, long-term ecological databases and a strong commitment to information management. Hundreds of ecological databases are managed through the Forest Science Data Bank (FSDB), which has long been an essential component of the Andrews Forest LTER and is jointly sponsored by the OSU College of Forestry and the US Forest Service PNW. The FSDB is managed through an information management system that supports the collection, quality control, archival and long-term accessibility of collected data and associated metadata. The Andrews Forest LTER maintains an extensive bibliography and image library, and personnel and keyword databases. The site is also active in LTER network projects including development and maintenance of the ClimDB/HydroDB intersite climate and hydrology database. See the Information Management page for more information. Andrews Forest science has long played an influential role in federal forest management and in public and policymaker perceptions of old-growth, watershed processes, road hydrology, and the role of dead wood in forests and streams. Social scientists at the Andrews Forest seek to identify social processes that explain the changing relationship of Andrews Forest science to federal forest policymaking, reveal social mechanisms that decouple federal forest policy from actual management practices, and evaluate the potential for the emergence of an adaptive governance system characterized by tight connections and feedbacks between scientific discovery and forest management. Past research has included analyses of public perceptions of LTER science, barriers to adaptive management, and the social acceptability of alternative silvicultural practices associated with ecosystem-based management. Andrews social scientists use both qualitative and quantitative methods and seek to integrate findings with long term biogeophysical and geospatial data. Work on soils in the HJ Andrews Experimental Forest began with a soil survey conducted in 1962 by Forest Service scientists. Early work on soil characterization focused largely on hydrologic properties. More recent studies concentrated on carbon storage in soils supporting tree stands of different ages, root decomposition, and nitrogen fixation. Both early and recent studies examined effects of forest harvest practices on soil erosion. Ongoing efforts include an updated SSURGO Soils Classifications Map and the initiation of a long-term soil sampling program to support research on hydrology and biogeochemistry. In 1997 the DIRT (Detrital Input, Removal, and Trenching) experiment was installed as a part of a national network of similar experiments. The DIRT experiment tests questions on how soil carbon is stabilized and destabilized by manipulating aboveground litter input (removed to double), fine root input (trenching), addition of woody detritus, and removal of the A horizon. Other studies have examined the movement of carbon and nitrogen in soils and how soil properties control the release of nitrogen following timber harvest. Stream ecology research has been designed to explore long-term processes that shape aquatic ecosystems, identify critical links between forests and streams, and examine the influences of natural and anthropogenic disturbances on stream communities and processes. Research includes long term population dynamics and community interactions for vertebrates (fish and salamanders) and invertebrates (insects), geomorphic and hydrologic processes, riparian dynamics, nutrient retention and fluxes, and drivers of stream temperature from reach to landscapes. Understanding the role of vegetation succession in forest ecosystems of the Pacific Northwest is a fundamental part of long-term ecological research at H.J. Andrews Experimental Forest. We seek to understand how plant communities change in composition and structure over time and what processes control these changes. We are particularly interested in how changes in vegetation affect water-use, carbon storage, nitrogen cycling, and disturbance regimes. Vegetation research uses data from a large network of permanent study plots across a wide range of stand ages, habitats, management histories, and disturbance types in Oregon and Washington and data from long-term monitoring of experimental watersheds at the H.J. Andrews Experimental Forest. The long-term data from the permanent study plot program provides the only means of directly observing the relatively slow dynamics of Pacific Northwest forests. See our Permanent Vegetation Plots page for more information on plot locations and history. Researchers at the Andrews Forest LTER are actively involved, both leading and participating in many cross-site projects Cross-site studies are encouraged among LTER sites and more broadly. Many of the cross site collaborations involve scientists from USFS Experimental Forests, biological field stations and other sites of long term research. The LTER Network creates scientific, social and administrative opportunities for cross site collaborations through funding for workshops and meetings. As a global leader in long-term research and monitoring activities, the U.S. LTER Network has established linkages with existing and developing domestic long-term ecological programs, as well as similar programs around the world. These relationships range from exchanges at the individual scientist and site research program levels to participation in international meetings to global-scale research planning and collaboration. The Andrews Forest LTER has been actively engaged in international LTER work, from active cross-site collaborative research to being instrumental in the establishment of international LTER sites in Asia, South America, and Central Europe, and to participation in the US ILTER Committee. The Andrews Forest LTER program and scientists have long history of study of biota and ecological and geophysical processes across the Pacific Northwest to test science concepts beyond the confines of the Andrews Forest and to explore ecological and socio-ecological phenomena operating at larger scales. Some studies capitalize on the regional network of research sites and other studies evaluate large geographic areas.